AMD's B350 chipset appears to be the go-to solution for the new Vega-infused Ryzen chips we took a look at the other week. What makes most sense in our eyes is a small-form-factor board that doesn't break the bank. MSI is of this thinking and has had a solid line-up since Ryzen's initial launch last year. 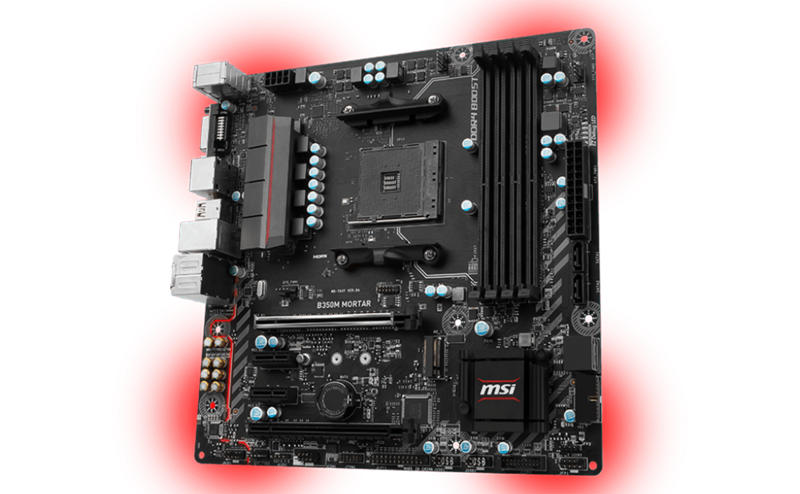 Bringing renewed focus to the micro-ATX form factor through the release of IGP-enabled CPUs, we take a closer look at the £80 MSI B350M Mortar. The overall aesthetic is based on the Tomahawk model and that's no bad thing. But if the black PCB isn't your cup of tea, there's also a white version, dubbed Arctic, available for an extra fiver. Looking for value rather than full-on features, the LEDs on the underside of the board, along with the trace line by the audio, are red only - no RGB control on this model. That said, the board features the usual RGB strip via a 4-pin header. Do understand that the lighting of said strip falls under the auspice of MSI's software utility, and control is limited to what that allows, meaning you won't experience RGB in all its visual glory. 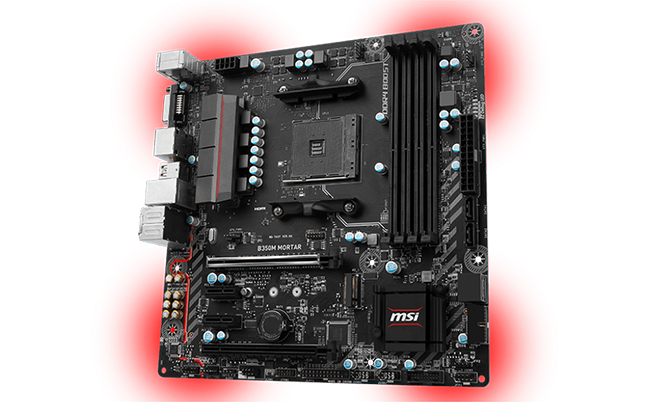 A micro-ATX size offers up easier integration of the various ports and slots than, say, mini-ITX. The four DIMM slots ought to be coloured in dual-channel mode, though if you do put two sticks next to each other - in single-channel configuration - a BIOS screen pops up and informs you of the potential faux pas. Colour coding them slightly, say, dark and light grey, would alleviate the problem for most. Peeking around the socket shows good space in which to mount larger coolers, and the DIMM slots are far enough away not to cause installation issues unless you use a truly monster heatsink. Overt cooling is kept to a minimum, as there's a low-profile heatsink down one side and nothing else of note. 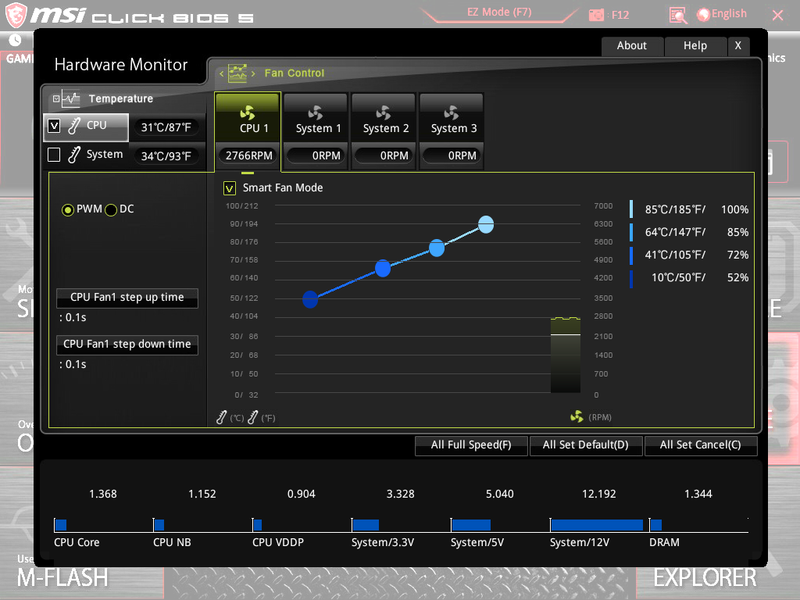 We sometimes see heatpipes traversing between the VRMs and PCH, but guess that MSI wants to keep to the value approach. The board features four SATA ports on the right-hand side. Two are rotated whilst the other two, just above and next to the ATX port, are standard. One can run all four and still use an M.2 slot at x4 NVMe for Ryzen chips. Speaking of which, a single unshielded M.2 slot is just underneath and to the right of the solitary x16 port usually reserved for discrete graphics duties. Note that whilst the board has a second physical x16 (non-strengthened) slot at the bottom, the B350 chipset doesn't allow for lane splitting from the CPU, so it's only useful for non-video add-in cards and is run via the PCH. And if you're using the second-generation Ryzens we spoke about at the top of the page, they only have eight PCIe lanes for graphics in any case. Put simply, for most, this is a single video card board. 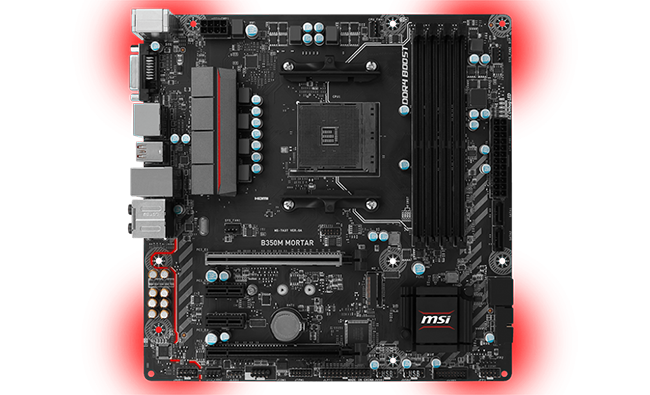 B350 has a couple of USB 3.1 Gen 2 ports baked into the chipset but MSI, as far as we can tell, doesn't use any. Rather, the board supports four USB 3.1 Gen 1 (5Gbps) from the PCB header and, as you see in the picture below, another four - 3x Type-A, 1x Type-C - on the back. These all run at half the maximum speed of the newer specification. Another cost-cutting measure is with the Realtek ALC892 audio codec, present here instead of the ALC1220 we see on boards costing closer to £100. Cooling potential is better, with a trio of 4-pin headers dotted in good locations. Each supports either PWM (constant voltage) or DC (variable voltage) modes and can be configured in either state in the BIOS. There's no watercooling-specific header with more capability, however. DVI, HDMI and DisplayPort are sensible video outputs when running a GPU-laden second-generation Ryzen chip, and the latter can export video out at 4K60. Ethernet is provided by Realtek and we see the usual audio outputs, too, including optical out. 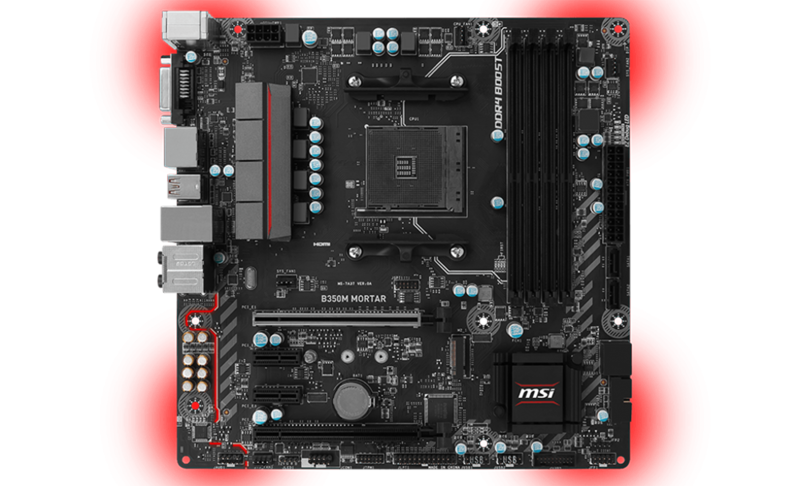 Though not necessarily a bad thing if done correctly, we get the feeling that MSI has looked at all the components/features on a modern motherboard and opted for an entry-level spec for this AM4 offering. It costs about £10 more than bargain-basement boards that don't feature a second x16 slot and usually only have a couple of DIMM slots. 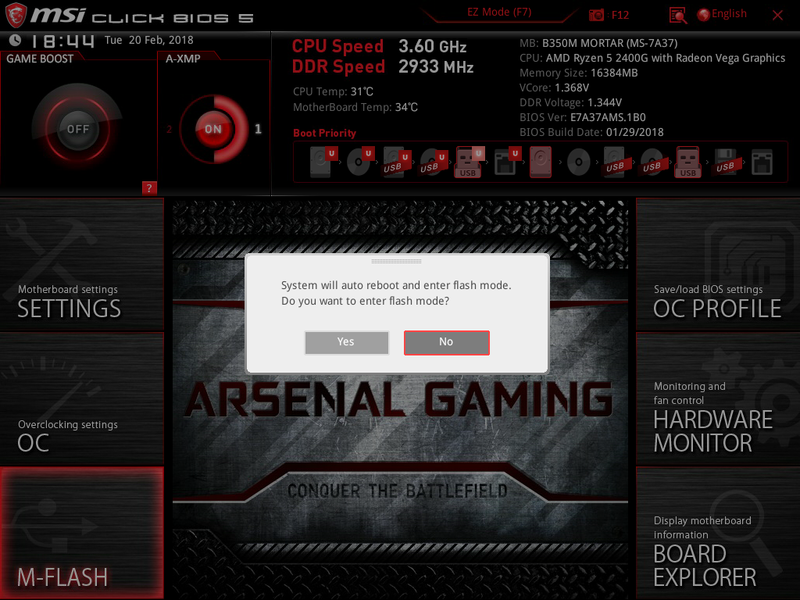 MSI uses the Click BIOS 5 across a range of boards, and the B350M is no exception. It feels a mite slow compared to, say, Asus, and MSI can be charged with almost having too much information on the various screens. We're still not fans of having to reboot to update the BIOS, but you can skip this step during the Post sequence if needs be. 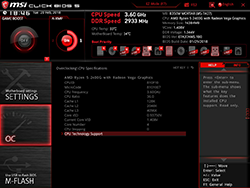 Fan control is reasonable to good, with four draggable points to create a custom fan curve, and we appreciate that MSI doesn't play any funny games with the chip's turbo frequencies. The test Ryzen 5 2400G ran just as specified by AMD. 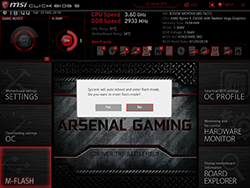 MSI offers a one-stop overclock by pressing the left-most red button on the main configuration screen. It works okay for the most part, but you can certainly get more out of the board by tuning manually. 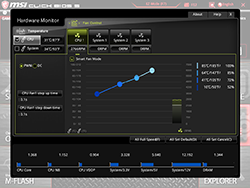 Unlike the recent Gigabyte mini-ITX mobo, the MSI correctly applies a GPU overclock, as you will see in the overclocking page. Last but not least, the board has supported second-generation Ryzens since December. 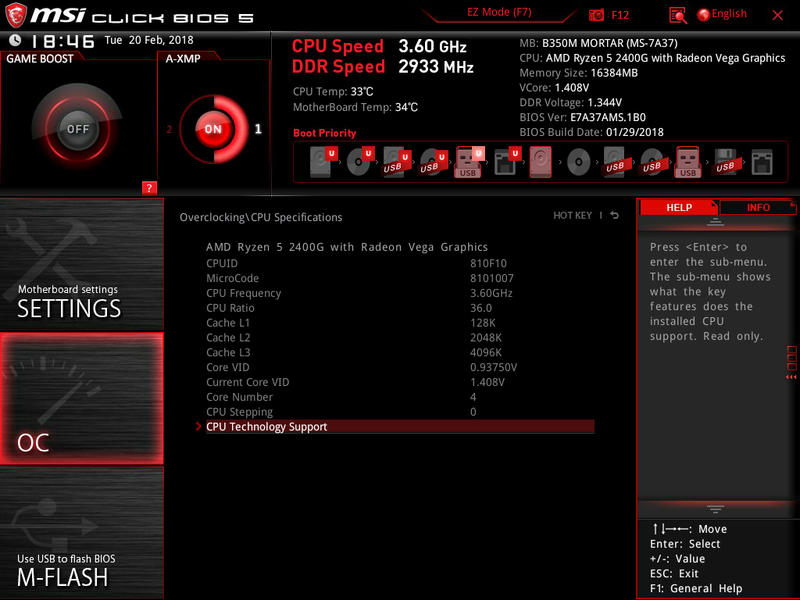 We tested with the latest available BIOS and can report no stability problems.